Hello to all you lovely readers! I hope you all have a wonderful week ahead! I thought today would be a good time to write up this post, it’s all about Christmas Gift Ideas for her and a few little stocking filler ideas too! I love Christmas gift sets and this is no exception! I wouldn’t actually give this to someone as the ‘main‘ christmas present but I would give it to someone as a stocking filler! You get a razor and a gold beauty bag which is really cute and perfect for keeping lip balms and small skincare items together. Leighton Denny is rapidly growing and considered to be one of the top nail brands in the beauty world and these gift sets are both wonderful. Not only do you get nail colours but you also get ‘tools’ to help speed up the drying process and also top coats to make colours last longer. Luxury from the outset and everything right down to the bottle is presented beautifully. Every brand brings us lovely gift sets around Christmas and I love stocking up on my favourite products this time of year – the John Frieda “For the love of big hair” gift set brings you sample/travel sizes of a shampoo, conditioner, root booster and hairspray! So – why not treat yourself to a gift set and make sure your hair looks great during the party season! Perhaps there’s someone who isn’t really fussed with beauty products or they simply have too many, this is a great option as it’s not just a hairbrush. Ah, I received this a few weeks ago and it has quickly become my favourite paddle brush! My hair is curly/wavy depending on it’s mood but this de-tangles easily, quickly and leaves hair soft and smooth! You all know how much I love Clarins, it’s one of the top brands for me and their skincare/makeup products are always lovely to use and have that luxury feel about them. This is a wonderful gift for someone as it’s a nourishing day cream and I know that anyone using their products will be happy. This isn’t a hairspray but I LOVE using it on freshly styled hair for all over shine, it just makes my hair look shinier and a lot healthier – perfect for the party season and beyond! This is another favourite product of mine and perfect for someone who may be on the fussy side! Use it as a moisturiser, as a lip balm, on chapped skin, cuticles, small wounds – the list is almost endless and is a wonderful multi-use product! 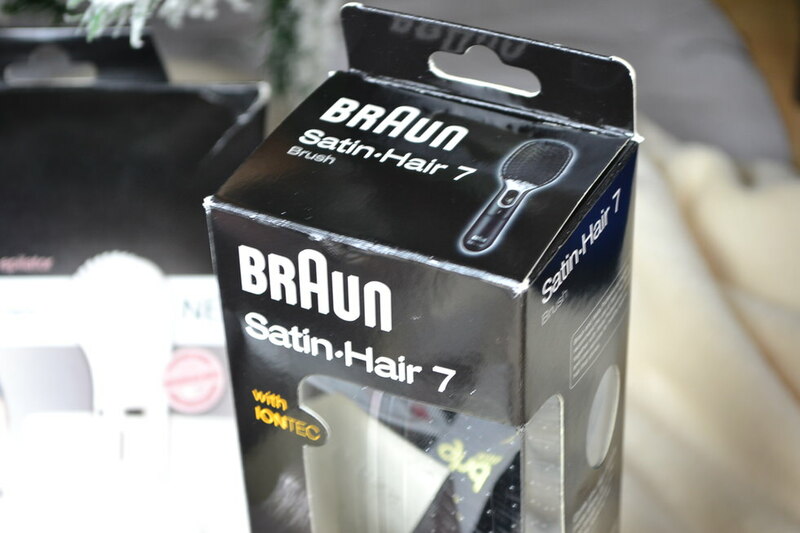 Finally we come to a much loved product, the world’s first Braun Face Cleansing Brush and Mini Epilator – think beauty treatments at it’s best (and at home) I use the cleansing brush daily, it just makes cleansers work a lot better and products can work on the skin a lot better too – the epilator is also great for keeping eyebrows in shape and removing any unwanted hairs. You all know that I absolutely LOVE hearing from you so let me know what you think in the comments below – do you love these items as much as me and has this sparked some ideas in your head for friends and loved ones? Cannot go wrong with some beauty-related stocking stuffers! 🙂 Great list, babe! So much great stuff! If I had to pick a favorite I would want the nails set- I’ve never heard of them but you sold me instantly! Although maybe I would pick the clarins cream- I love their products too! Great list! Gorgeous finds! The Leighton Denny set looks so pretty! Great suggestions! I think these could be great gifts for white elephants and secret santas! I am in love with EA 8 hours cream. I use it solely as a lip balm but it is the best so far at keeping my lips from cracking. Must say holy expensive lip balm though. LOL! Hi honey, but how many gift idea have you??!?!? The GHD paddle brush looks like fab! Great ideas! I want them all! Wow Layla that’s an amazing gift guide. I love everything! Wonderful ideas! I really need to try that famous 8-hour cream! Great gift ideas! I’d be happy to find my stocking filled with treasures like this!